Security Onion 20120329 now available! The NSM scripts now pass the "-F /etc/nsm/$HOSTNAME-$INTERFACE/bpf.conf" to Snort and Suricata and "-f /etc/nsm/$HOSTNAME-$INTERFACE/bpf.conf" to daemonlogger. However, Suricata's afpacket mode currently doesn't support bpf. I've created Suricata feature request #440 for this. Security Onion 20120326 now available! Please note that the new snort.conf will overwrite your existing snort.conf. 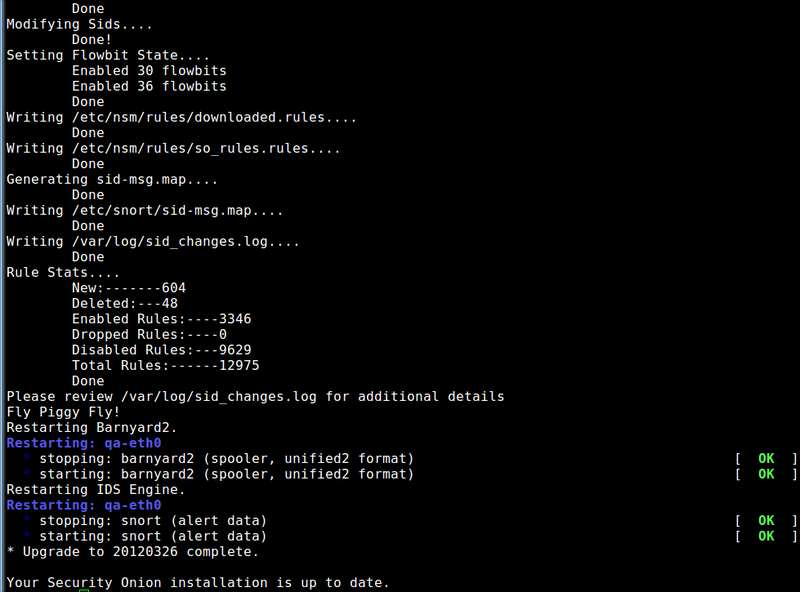 Your existing snort.conf will be backed up to /nsm/backup/20120326/NAME_OF_SENSOR/. Please copy any customizations (HOME_NET, etc.) from the backup copy to the production copy /etc/nsm/NAME_OF_SENSOR/snort.conf. Thanks to Sourcefire for Snort 2.9.2.1! Security Onion 20120321 now available! Issue 237: Snorby 2.5.1 - This is a bugfix release. It fixes several issues in Snorby 2.5.0. Thanks to Dustin Webber for the quick bugfixes in Snorby 2.5.1! If Security Onion has provided value to you and/or your organization, please consider giving back to the community by donating your time to the above needs! If interested, please contact me via email (I won't publish it here, but you can find it on our mailing list). Thanks! If you see any changes that need to be made or documentation that needs to be added, please write it up and we'll get it posted! If Security Onion has provided value to you and/or your organization, please consider giving back to the community by donating your time to the above needs! If interested, please contact me via email. Thanks! Security Onion 20120312 now available! 1. securityonion-ruby contains Ruby 1.9.2-p290 and replaces the existing system-wide Ruby 1.8 (/usr/bin/ruby). 2. securityonion-snorby contains /usr/local/share/snorby (Snorby 2.5.0 and all required gems using "bundle install --deployment"). 3. securityonion-passenger allows us to run Snorby under Apache instead of using Ruby's "thin" web server. These separate packages will make our Snorby implementation faster, more standardized, more secure, and more maintainable. In addition, this update brings the newly-released Snorby 2.5.0, which has many features and bugfixes! /usr/bin/sostat is a simple bash script which collects details about your system and its processes. When asking for help on the mailing list, we may ask you to run "sudo sostat" and copy the output to your email so that we can have some data to help us diagnose your issue. We also recommend running sostat in a daily cronjob and having it send you an email for review. Thanks to Dustin Webber for his hard work on Snorby 2.5.0! When updating a Security Onion SENSOR (that sends its alerts to a separate Security Onion server), the update will try to start MySQL, but it will hang since port 3306 is already in use (being forwarded to the server over SSH). You can simply kill the startup since MySQL is currently not used on Security Onion sensors. On subsequent reboots, MySQL will startup, but when /etc/init/securityonion.conf executes, it will stop MySQL and bring up the SSH tunnel with port 3306 forwarded to the server. If you have any questions or problems, please send a detailed email to our mailing list. Thanks! SANS is coming to Augusta GA in June! SANS is coming to Augusta GA in June! Doug Burks will be teaching SANS SEC503: Intrusion Detection In-Depth and Mark Baggett will be teaching SANS SEC560: Network Penetration Testing. UPDATE: You can save $500 if you register for one of these classes by May 2. In addition, ISSA members are eligible for a 10% discount! The discount code was sent to the ISSA Members mailing list. If you are a member and you didn't receive the discount code, please contact a Chapter Officer. If you're not already an ISSA member, please consider joining so that you will be eligible for this and other discounts in the future. Security Onion 20120229 now available! Thanks to Rhoda Dendron for reporting the missing mon interface in Setup! Thanks to Heine Lysemose for reporting the Snorby development mode issue!